Agie Agiecut 170 CNC Wire EDM Machine s/n 236 w/ Agiematic CF70 Controls, Agiepuls MMD Power Source, DA-15/PF Filtration and Coolant System, Remcor Cooling System, System 3R Tooling Base. 1995 Fine Sodick “Mold Maker 3” CNC Die Sinker EDM Machine s/n T-8434 w/ TX21 Controls, System 3R Tooling Head and 4-Station Tooling Rack, Filtration and Coolant System. Supermax MAX-1 CNC Vertical Machining Center s/n 806456 w/ Fanuc 11M Controls, 16-Station ATC, BT-40 Taper Spindle, 45-6000 RPM, Coolant. Matsuura MC-500V CNC Vertical Machining Center s/n 86045418 w/ Yasnac MX2 Controls, 20-Station ATC, BT-35 Taper Spindle, 15” x 34” Table, Coolant. Mori Seiki MV-35/35 CNC Vertical Machining Center s/n 240 w/ Yasnac MX1 Controls, 20-Station ATC, BT-35 Taper Spindle, Chip Conveyor, Coolant. 2003 Advanced Industrial Technologies mdl. KCM CNC Broaching Machine s/n 3045 w/ Fanuc Series 0i-M Controls, Troyke 4th Axis 9” Rotary Table, (2) Pneumatic Accessory Tools. TOS type SUS-63 26” x 234” Geared Head Lathe s/n 0436706 w/ 9-1120 RPM, Inch/mm Threading, Tailstock, Steady Rest, Tool Post. Poreba HRC48-54 42” x 216” Geared Head Gap Bed Lathe s/n 1194-239 w/ 4 ½” Thru Bore, Inch/mm Threading, Tailstock, Steady Rest, 31 ½” 4-Jaw Chuck. 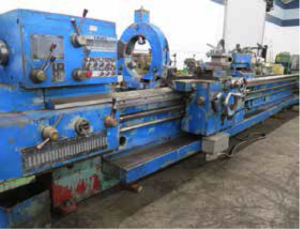 TOS type SN-63B 25” x 128” Geared Head Gap Bed Lathe s/n 063300800335 w/ 3” Thru Bore, 10-1000 RPM, Taper Attach, Inch Threading, Tailstock. Axelson 24” x 50” Geared Head Lathe w/ 8-609 RPM, Inch Threading, Tailstock, 18” 4-Jaw Chuck. (2)Hardinge DSM-59 Tool Room Lathes s/n DV-59-11592 w/ 125-3000 RPM, 5C Collet Closer. Hardinge HC Hand Chucker w/ Threading Attachment, 8-Station Turret, Power Feeds. King 52” Vertical Turret Lathe w/ 2.5-72.1 RPM, (1) Rigid Turning/Boring Head, (1) 5-Station Turret Head, (1) Side Facing Head, 52” 4-Jaw Chuck. King 60” Vertical Turret Lathe w/ (2) Boring/Facing Heads, 61 ½” Table. Shibaura BFT-9R Horizontal Boring Mill s/n 4198 w/ DRO, 10.4-1000 RPM, 3 ½” Spindle, 39 ½”x 47 ½” Indexing Table, Tailstock, 19 ½” Boring Head. Bridgeport Series 1 – 2Hp Vertical Mill s/n 227317 w/ Mitutoyo DRO, Power Feed, Chrome Ways. Tree 2UVRC Vertical Mill s/n 9800 w/ Acu-Rite DRO, 60-3300 RPM, Box Ways, 10 ½” x 48” Table. Moore No. 3 Jig Boring Machine s/n B1037 w/ Acu-Rite Programmable DRO, 2500 RPM, 11” x 24” Table. (11) 25”L x 8”W x 27”H Tombstones w/ 25” x 25” Bases. (2) 18”L x 18”W x 25” and 34”H Tombstones w/ 25” x 25” Bases. Scherr Tumico 30” Floor Model Optical Comparator w/ DRO, Surface and Profile Illumination. Flammables and Corrosives Storage Cabinets. Rowe 50” Slitting Line w/ Rowe T3-50 .020”-.085” Slitter s/n 25391, Rowe H-1652 Hydraulic In-Line Shear, Rowe 16060-DSV 16,000 Lb x 60”W x 72” OD Cap Reel Unit, Rowe BGY-12 12,000 Lb x 60”W x 60” OD Cap Coil Car. Pope 8’ Plate Roll w/ 3/8” @ 8’, ½” @ 4.5’, 5/8” @ 3’, ¾” @ 2’ Roll Cap. Verson 50 Ton x 8’ Press Brake s/n 24900-2078-50 w/ 2 ½” Stroke, 4” Adj., 12” Shut Height. Pines mdl. M-04719 Cutoff Machine w/ Hydraulic Shear Head, Power Feed, Conveyor. Pines mdl. M-14546 Double End Deburring Machine s/n 66600-81045 w/ Feeder. Custom Hydraulic Tube Expanding Machine w/ Muffler Expansion Dies. Strippit Custom 18/30 Duplicator Punch s/n 324102976 w/ ¼” Cap. Unipunch “PRT Gaging Machine” Fabrication Punch s/n PRT-9-79-015 w/ 18” Throat. Rousselle 3G 25 Ton C-Frame Stamping Press s/n 19570 w/ 2″ Stroke, 135 Strokes Per Min, 2″ Slide Adj. Unholtz-Dickie mdl. 206H and 56E Electrodynamic Shakers. Temptronic ThermoStream mdl. TP-04000A-2B21-1 Temperature Forcing Thermostream System. Camelot Systems “Cam/alot” mdl. 1818 CNC Dispensing System s/n 1818-2387 w/ Video System. ESI Electro Scientific Ind. mdl. 44 Laser Trimming Machine w/ ESI Controls, YAG Laser, Video Monitoring. Cambridge “Stereoscan 250” mdl. 7920STW-4SI Si(Li) X-Ray Detector s/n 6-2293. Hitachi mdl. S520 Scanning Electron Microscope. Cambridge mdl. S100 Scanning Electron Microscope s/n 1141. Veeco mdl. VE-401 Thermal Evaporator Vacuum Deposition System. (2)2007 Baker Co. mdl. EG-6252 Stainless Steel Laboratory Flow Hoods. Terra Universal and IAS Laminar Flow Hoods. Kewaunee Stainless Steel Glove Box w/ (2) Vacuum Anti-Chambers. Thermotron Large Capacity Thermal Test Chamber w/ Control Consoles. Banner Technical Devices mdl. MARK I-C Mark-1 Wave Soldering Machine s/n 283-2805. Hughes Wire Bonder, Adaptive Bonding System and Die Bonder Systems. Plasma Technologies μETCH Plasmalab Etching System. Avco Type SM-110 mdl. 3 Shock Machine. Gorman Torid Winder and Geo Stevens Winding Machines. Semiconductor Equipment Corp mdl. 850 Flip Chip Placement System s/n 850-0051 w/ Acces. SCP Process Cleaning System, Fluoroware Systems 2-Cycle Wash System and SPS Special Plastics Systems Etching System. AEW Engineering mdl. 900M Type MK-8 36” Vertical Meat Saw s/n H-19086-HB w/ 50” x 59” Table. Bizerba Automatic Price and Goods Labeling Machine s/n 10324645 w/ PLC Controller, 12” Belt. Jaccard “HORD II” Dough Press w/ 24” Belt. Vacu-Fresh mdl. E-42085 18” x 22” Vacuum Packaging and Cutting Machine s/n 69620694-FS20T. Doboy mdl. B-450 Heated Bag Sealing Machine s/n 93-16070 w/ 6” Belt. True mdl. TSSU-60-16 60” 2-Door Sandwich / Salad Preparation Refrigerator. True mdl. TSSU-72-18 72” 3-Door Sandwich / Salad Preparation Refrigerator.